Since years, Salesforce users were using operational reports and dashboards to access their business data, analyze business performance and deliver results. It was a tough task for them to manually manage data, as over the year the amount of data has grown exponentially. As analytics became more vital for businesses than ever before, Salesforce has launched their own analytical platform called Einstein Analytics. The core intention was to allow Salesforce users identify critical business trends, understand every correlation and test every hypothesis by using advanced analytics powered by artificial intelligence (AI). Einstein Analytics became a huge success immediately as companies used it in order to facilitate their sales process, service agents, marketers and business analysts to make customer interaction smarter and data-oriented. In the first phase of its release, Einstein Analytics delivered a huge portfolio of contextually relevant and powerful apps that empower every Salesforce users to explore data and unfold insights. Built on world’s #1 CRM platform and powered by AI, Einstein Analytics can automatically process and analyze billions of data to discover new opportunities for Salesforce users. Since it’s introduction, Salesforce used to add new features and upgrade Einstein Analytics for better business visibility and results. In their latest Spring’18 Release, Salesforce amazed the entire world of analytics with it’s latest Einstein Analytics features and the ability to work faster and smarter with Einstein intelligence and Lightning benefits. Salesforce has launched the second beta version of their Lightning report builder with powerful features in their Spring ’18 release. With bucket columns, cross filters, and summary formulas, it has become more user-friendly. One can avail all the advantages of Lightning report builder once they upgrade to the Lightning platform. Salesforce has scored few integrated and fun learning features to their Einstein Analytics platform. Now you can quickly query and add visualize data in a guided, natural language conversation(beta). 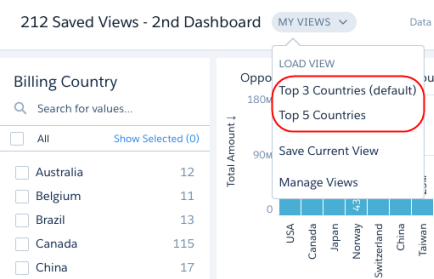 You can save views of dashboards with your preferred set of selections and filters. Users can now analyze their report data with Einstein Data Insights (pilot). In this blog post, we are going to highlight all the important Einstein Analytics Spring’18 release notes. We can categorize all the new features into 5 segments and discuss each of them individually. This came with expanded help menus, learning map and adventure app. To add more value to their customer service, Salesforce has included in-app Help, walkthroughs, resource maps, and samples of chats and app building. A user can find the best approach that works for him. The Einstein Analytics Help menu has a new design. Now a user can access resources, from documentation to videos whenever required and wherever you are in the Einstein Analytics. Now you can preview help articles in the menu without signing out from the app. In the new Help menu, one can access the walkthrough option which will guide in the explorer by pointing out major features. The new Learning Map offers a set of key resources for each action in every stage of the Einstein Analytics journey. This map is highly engaging and helps users access smoothly inside the analytics platform. 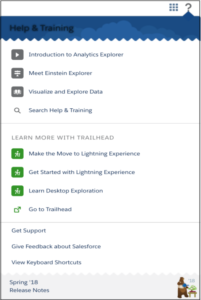 For the first time, Salesforce has introduced Einstein Analytics Learning Adventure app that educates on best practices for designing right visualizations and for developing robust and dynamic apps. This app was built and runs in Einstein Analytics. This allowed conversational exploration, context-sensitive chart builder, and images in tables. App building creates charts more quickly by specifying which fields to use for chat features like axes, bubble size, and bubble color. Make tables visually pleasing by displaying photos, icons, and other related images. A user can create his/her own view of a dashboard by selecting preferred sections and filters. You can now see results over time with the new time bar and time combo charts and can even share information about each data point in a chat with customized tooltips and markers. The Analytics platform continues to develop with more REST APIs and personal view support in embedded dashboards. Even you can write your own queries by using the new SAQL documentation. 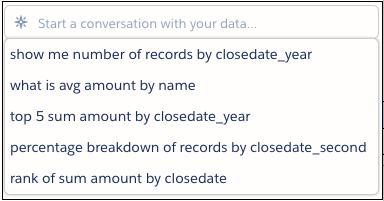 Salesforce added new connectors and improvements including Windows Azure and Snowflake to the Dataflow Editor and Dataset Recipes. With the new connectors, more data can be connected and it will spend less time in the data flow editor due to productivity tweaks. Each connection now counts toward the maximum of 50 objects (before it was 20) that you can replicate in Analytics. The dataflow editor now allows you rename nodes, override field attributes for Salesforce data, and produce field modifications to downstream nodes. You can run dataflow even without leaving dataflow editor. Export transformation generates the data file in a specified source node in the dataflow and once the dataflow runs, Einstein Discovery users can access these files in the Datasets tab. A user can now run and schedule recipes from the recipes list and quickly check what dataset the recipe is based on. Overall this will allow a user to take more control of data preparation with recipe enhancement and a better view of datasets. The latest enrichment of Einstein Analytics witnessed some interesting add-on features in Analytics Prebuilt Apps. Now it is easier to get valuable customization features to dig deep into your business data to analyze your sales, marketing, or service related insights. Prebuilt apps are now easier to customize, and can perform faster. You can now point and click to enhance Sales Analytics and Service Analytics dashboards as per your requirement without the help of any code. With global filters, dynamic time period selectors, and other additional enhancements both apps are faster and more robust than before. Two separate dashboards for service team and technical team help them understand the flow & deliver great customer service. Blended with the Service Analytics app, Field Service Analytics allows service managers and technical managers just-in-time analytics to optimize the result of field service appointments. You can get a clear idea of your data and service interactions with the help of intuitive visualization. 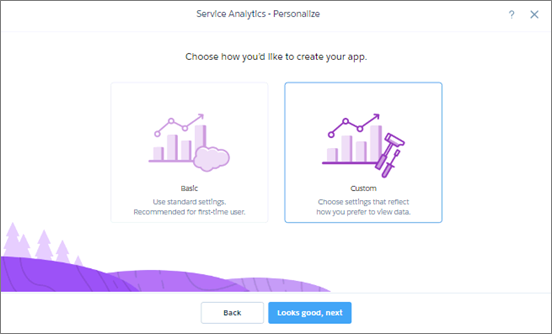 Einstein Analytics is now coming with a new wizard which let you pick between creating a basic and custom version of the app. This makes app creation easy and predictable. Service Analytics helps you identify actionable insights to improve customer conversation. Salesforce has introduced Einstein data insights (pilot) to produce smarter reports. Einstein intelligence will analyze your report data to help you understand it better by revealing the insight bits that you can work on. Einstein summarizes key takeaways, comparisons, and trends with engaging charts and metrics. You can also easily access more data in less time. With the use of Einstein Analytics dataflow, Einstein Discovery dataset has been created based on data from Salesforce objects, replicated objects, or existing datasets. Einstein Discovery supports data that contains UTF-8 character encoding. A user can now upload and analyze data in any language which uses the UTF-8 encoding such as Arabic, Russian, or Hebrew. Salesforce is now piloting native support for importing Einstein Discovery recommendations into a Salesforce object. There has been a lot of buzz about the much awaited Salesforce Spring ’18 Release and what is going to be next in Einstein? Though some of the features were predicted by many, Salesforce has introduced some highly exciting new features and stunned most of the Salesforce users. Now, few of the features will affect immediately, and few need an expert consultation before the users can leverage the new functionalities. But as spring often considered as the beginning, Einstein Analytics finally comes off age. New features and enhancements have intensified Einstein’s potential to help businesses close deals, increase customer relationships, and more. To learn more, how you can use the immense potential of Salesforce Einstein Analytics to optimize your business profitability, get in touch with our Salesforce experts today.